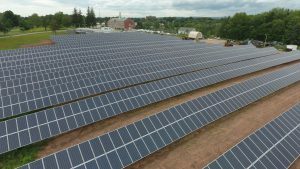 Wesleyan’s 750 kW-AC ground-mounted solar photovoltaic system produces approximately 1.2 million kilowatt hours of clean renewable energy each year amounting to about five percent of Wesleyan’s annual electric consumption. 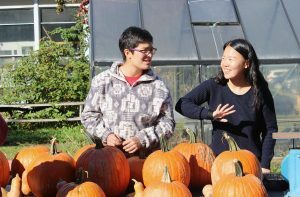 In November, Wesleyan’s Sustainability Office released its first Sustainability Action Plan Progress Report. This report highlights progress made toward SAP strategies between 2016 and 2018 in the areas of planning, engagement, health and well-being, academic operations, curriculum, buildings, dining, energy, grounds, purchasing, transportation, waste, and water. The report also outlines Wesleyan’s vision for 2021 and summarizes overall progress. A student-run organic farm on Long Lane grows produce for local food pantries and soup kitchens as well as the North End Farmers Market, and helps families with children on free or reduced-price lunches through a summer program on farming and food. The Waste Not program collects gently-used items during student move-out to donate to local social good organizations and to sell at a large tag sale. Since 2009, over $34,000 in proceeds has been donated to local organizations and Financial Aid. Food Rescue and composting efforts helped divert 111 tons of food waste through donations to the Eddy Shelter and composting. Four solar photovoltaic installations on campus add renewable energy to New England’s grid and prepare Wesleyan for long-term carbon neutrality. Local, owner-operated vendors and farmers provide at least 20% of ingredients to Bon Appétit, Wesleyan’s dining service, fulfilling Wesleyan’s 2012 commitment to purchase local and organic foods through the Real Food Challenge. In 2018, Wesleyan joined with the City of Middletown, Middlesex Community College, and Middlesex Hospital to design and print citywide recycling signage. Signs are now on all partner trash and recycling bins, as well as those at City schools, parks, and individual residential and commercial bins. Wesleyan student Ingrid Eck ’19 worked with the City of Middletown in summer and fall 2018 to assist in pursuit of Sustainable CT certification. Sustainable CT is a statewide program recognizing municipalities that meet holistic sustainability criteria; Middletown received Bronze certification in October 2018. A full-time summer fellow will continue this work in 2019.